The Israelis’ image of Zionism differed from that of most American and British Zionists. To Ben-Gurion and many other Israelis, the mission of Zionism included not only the creation of a Jewish nation but also the ingathering of Jews from what he and they viewed as galut or exile. Only with aliyah to Israel could one find fulfillment as a Jew. Moreover, from the galut perspective of history regardless of how secure or accepted Jews might feel elsewhere, alienation and persecution appeared inevitable. As a second but corollary issue, the Israeli government rejected compromising its sovereignty by taking direction from those voluntarily living in exile. Ben-Gurion called for the massive immigration of Jews to Israel. Few American or British Jews, whether Zionist or not, had any intention of emigrating. They were loyal to and happy in their own countries and rejected the notion of exile and its connotation of secondary status. But it was the desire of influential Zionist leaders such as Abba Hillel Silver and Emanuel Neumann for involvement in Israeli decisions, emanating from their pre-state direction of the Yishuv, that posed the greatest conundrum between them and the new Israeli government. Silver and Neumann wanted to shape the social, economic, and political culture of Israel on the American model and nurture a political party in opposition to Ben-Gurion’s Mapai to further those aims. They perceived the fate of American and Israeli Jews as bound together and sought an Israeli politic that would reflect well on American Jews. On the other hand, non- and anti-Zionists had long fought charges of dual loyalty and they, as well as most Zionists, had no desire to influence Israeli policies so long as those did not negatively impact them. Regardless of these differences, the Israeli government wanted and needed the financial support and access to American government officials available especially through members of the American Jewish Committee. Moreover, Jacob Blaustein, as leader of the AJComm, took a pragmatic stand that fit will with Ben-Gurion’s desire to limit diaspora Zionist influence on his government. 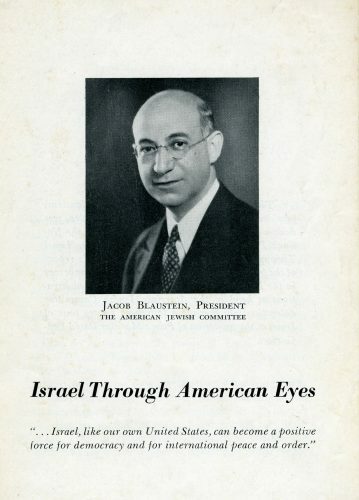 The non- and anti-Zionists whom Blaustein represented – even as most moved toward Zionism as time progressed – did not wish to direct the policies and affairs of Israel. As Melvin I. Urofsky observes, reaching an agreement through AJComm would also undermine the major fears and positions of the anti-Zionist American Council of Judaism thus de-legitimizing and isolating that organization. Blaustein also epitomized exactly the type of assistance Ben-Gurion and Israel most required. He enjoyed access to five presidents beginning with Franklin Roosevelt. He received presidential appointments to advisory councils because of his expertise in the petroleum industry. His unmatched work ethic and diplomatic acumen, as well as his extensive activities to assist Holocaust survivors and to promote human rights, provided him entrée to world leaders and the highest echelons of the United Nations. Blaustein and his cohort at the AJComm could lobby effectively in Israel’s behalf and raise money for its development and defenses. On the concept see Arnold M. Eisen, Galut: Modern Jewish Reflections on Homelessness and Homecoming (Bloomington: Indiana University Press, 1986). For an excellent summary of the literature and insights into the conflict between Silver, Neumann, and Ben-Gurion see Zohar Segev, “American Zionists’ Place in Israel after Statehood: From Involved Partners to Outside Supports,” American Jewish History 93 (September 2007): 277-302. However, Segev fails to note the Ben-Gurion/Blaustein exchange and how it facilitated the prime minister’s break with American Zionist Leadership. Urofsky, We Are One, 194-195; Sanua, Let Us Prove Strong, 56-58.